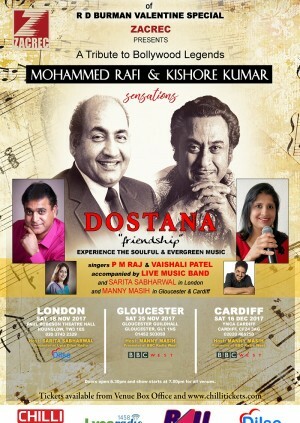 'Dostana' (Friendship ) is a night which will remind you the Golden Era of Bollywood and will tack you back in the soulful music. A night not to be missed, come and enjoy with your whole family and friends. P M Raj, a popular performer for Bollywood, Lollywood, Ghazal, Bhangra and Sufi Music who has worked with Bollywood melody queen Alka Yagnik and collaborated for a romantic musical album called 'Pal' (moment) released a few years ago which had a huge appreciation and also worked with Music Director Ravi Pawar (Mumbai). Raj also paired up Ravi Sharma ( Dil Se (Lyca Radio ) to do UK based projects and many more national and international artists. P M Raj grew up with Bollywood music and believes that Rafi ji and Kishore ji are his spiritual teacher and Gurus so please come and join him to pay a huge respect and tribute to great and genius Bollywood legends for a wonderful musical evening.